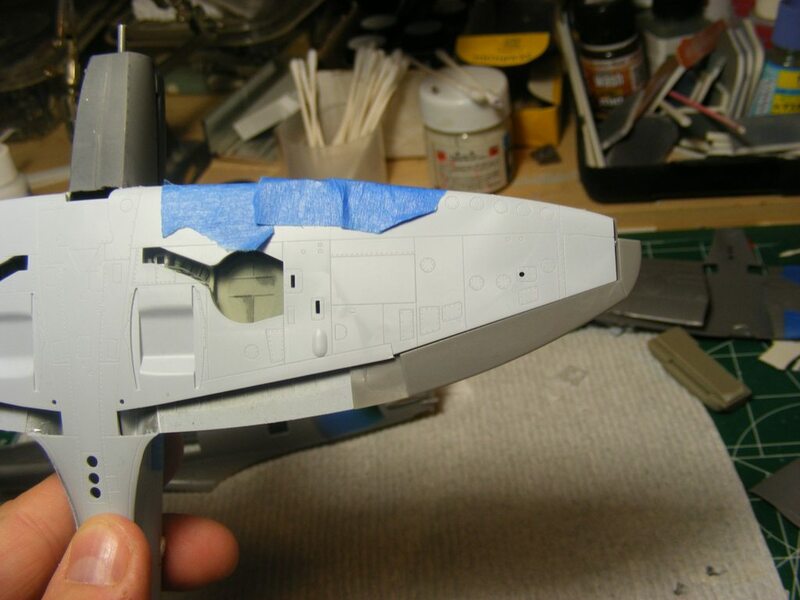 The Bishop dropship is more straightforward-- all resin parts fit with the precision of a good styrene kit, but I'm inspired by your photoetch work as I do the Bishop's cockpit PE parts. I've put a few shots of grey onto the nose, checking for clean seams, which are getting cleaner, and I haven't seen any bleed through yet. I may do a none acrylic clear coat to act as a barrier just in case before I lay down the main colors. Dang, that Bishop Drop Ship looks great! Good luck with it. As to frustration, I never find that as the reason I put a project 'on hold.' It's more just waning interest, which I'm trying to combat! Last edited by Tiberious; 07-11-2018 at 04:21 PM. Alright, a little bit of cleaning up needed, but I'll be moving on from the cowl now. It's in, the sides are even and the fasteners look good. I need to sand out some larger scratches but I'm good with this. Just exquisite modeling going on here. Mind boggling! What's mind boggling is that I haven't trashed it yet! I took a quick break from that to start on the gear. 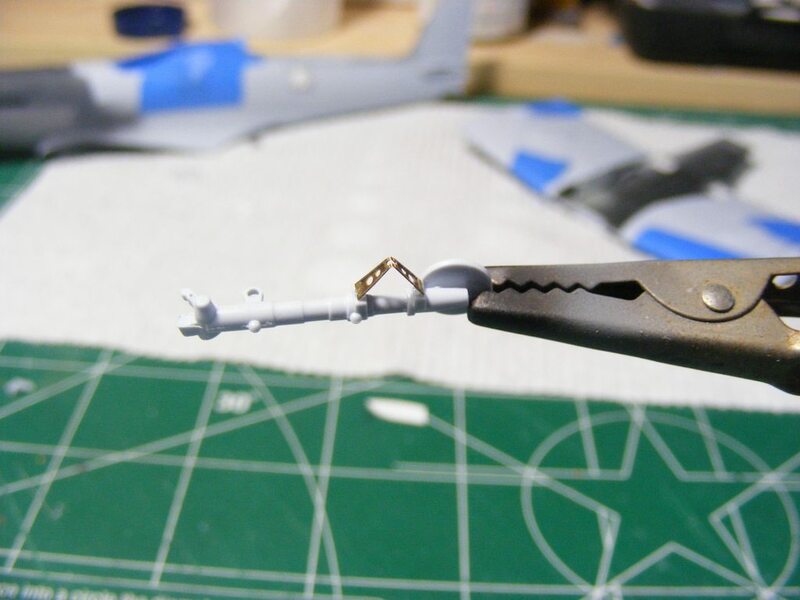 There are PE scissors that were glued in place, as well as a thin metal rod whose purpose is a mystery to me. 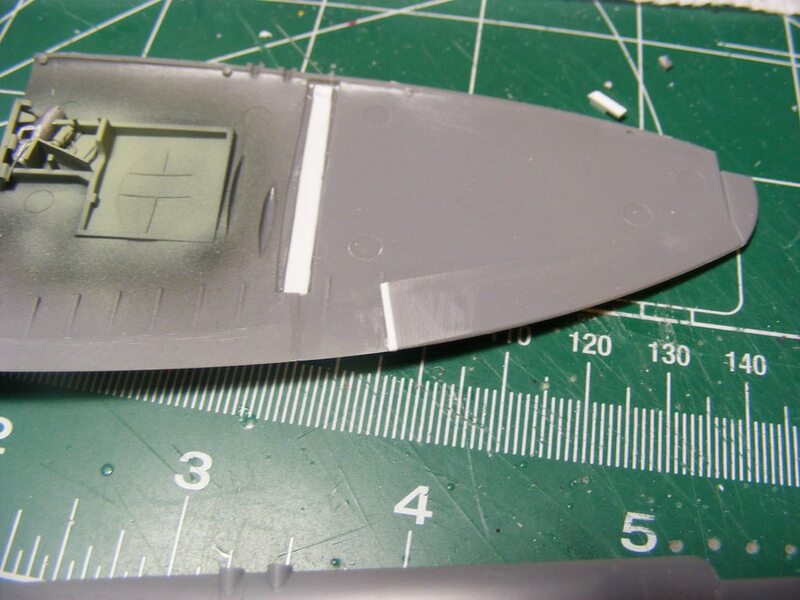 I fabbed that with stretched sprue. It's a little long and will need to be trimmed up at the bottom. 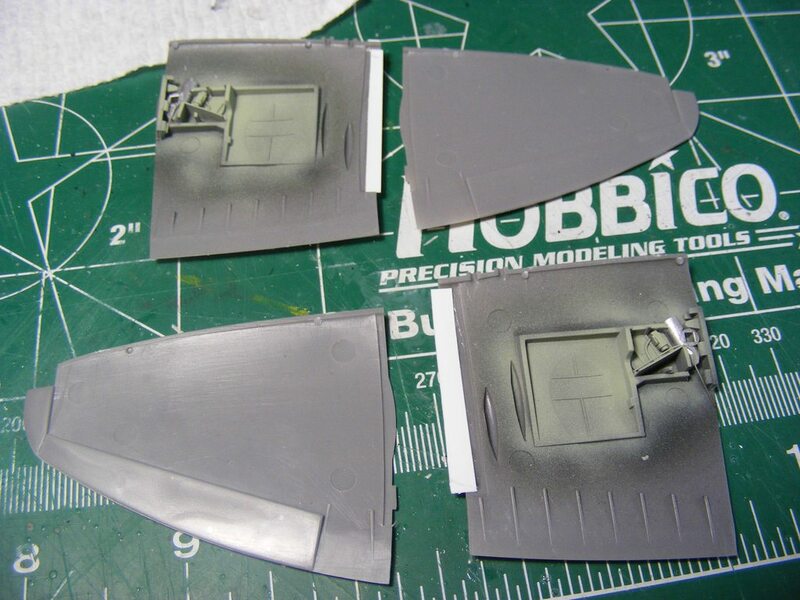 The ID lights for the belly were also done. I airbrushed them, but figure the next time I'll just brush paint them. Easier. And I started putting the wings on! I'm starting with the bottoms first and glued it in at the back before the front, just to keep that part level. 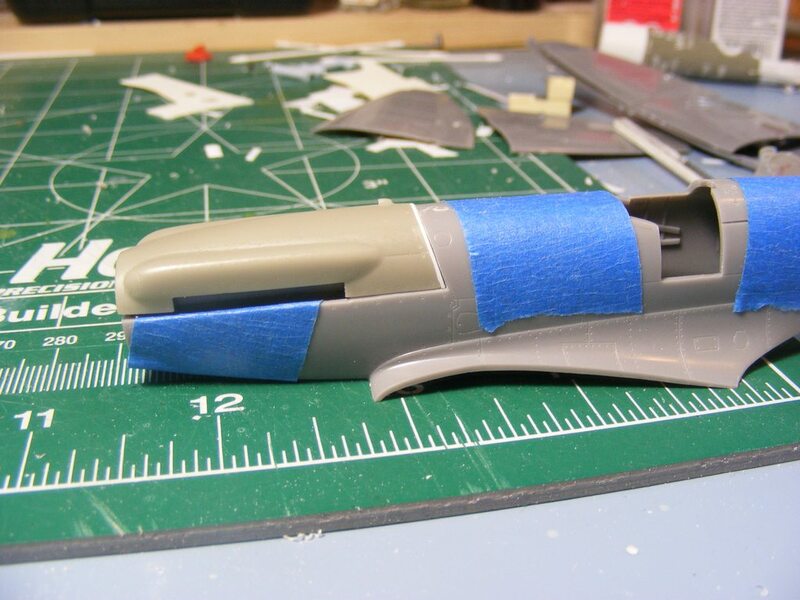 The gap where the wing curves back into the fuselage will be glued and smoothed last. 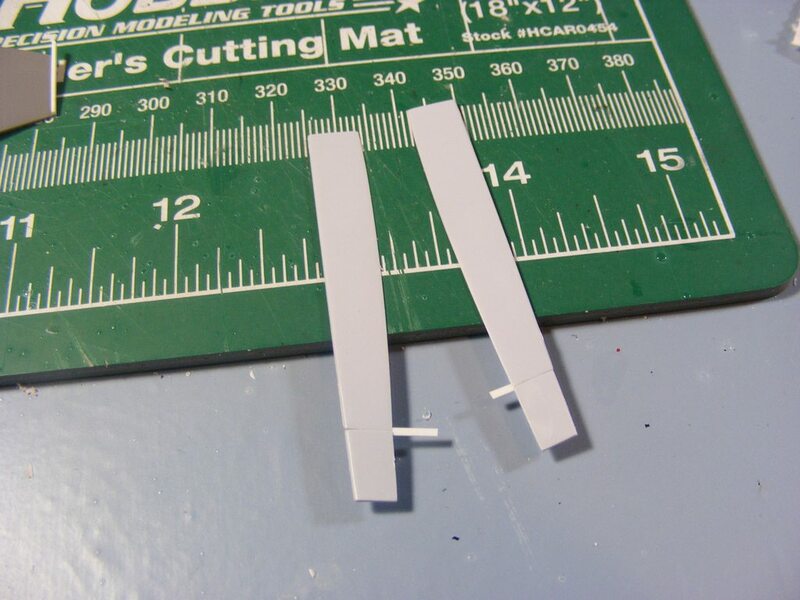 Once that's set, I'll test fit the upper panels, seeing how the seam looks and then use styrene to shim them. 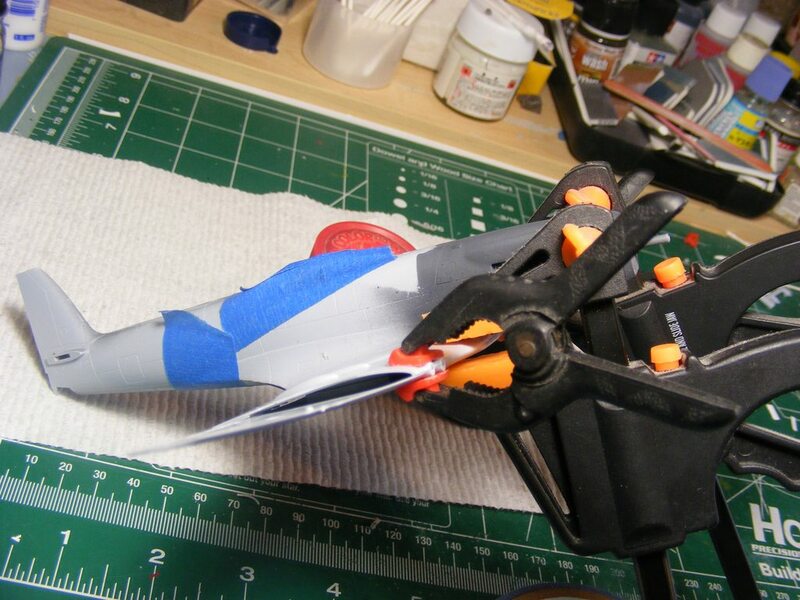 I want to get as good a line as possible before gluing the top of the wings in place in order to keep from having to sand afterward and risk losing detail. I can already see some gap that'll need filling. And some resin goodies came in today! And the new prop blades! Last edited by Tiberious; 07-13-2018 at 03:16 PM. 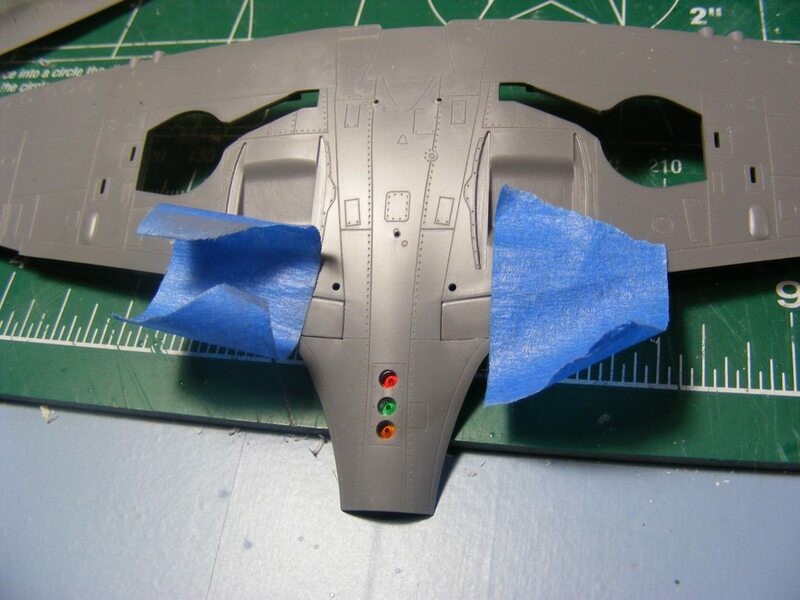 With the lower wing panel in place I test-fitted the upper wings panels to see what kind of fit issue is going to show up. 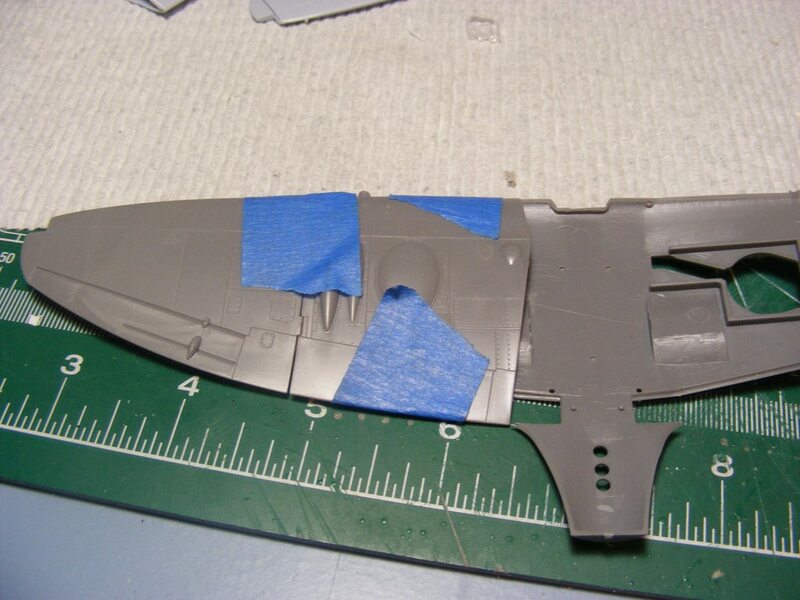 The port shoulder looks pretty good with a small gap at the bottom, and reverse for the starboard side. 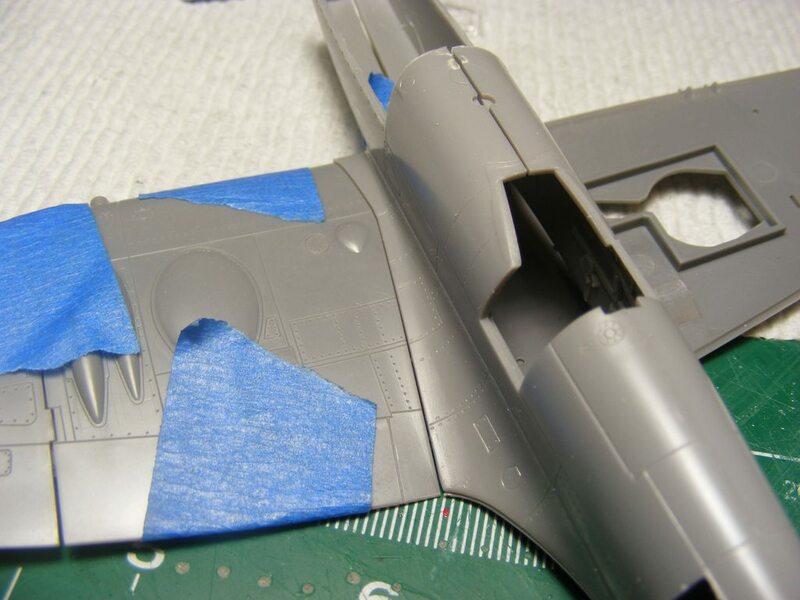 I'll mark those areas and layer some styrene along the edge and sand them to shape, hopefully negating a putty or sanding after they are finally glued in place. Well, some set backs and set forwards have happened in the intervening 6 days. 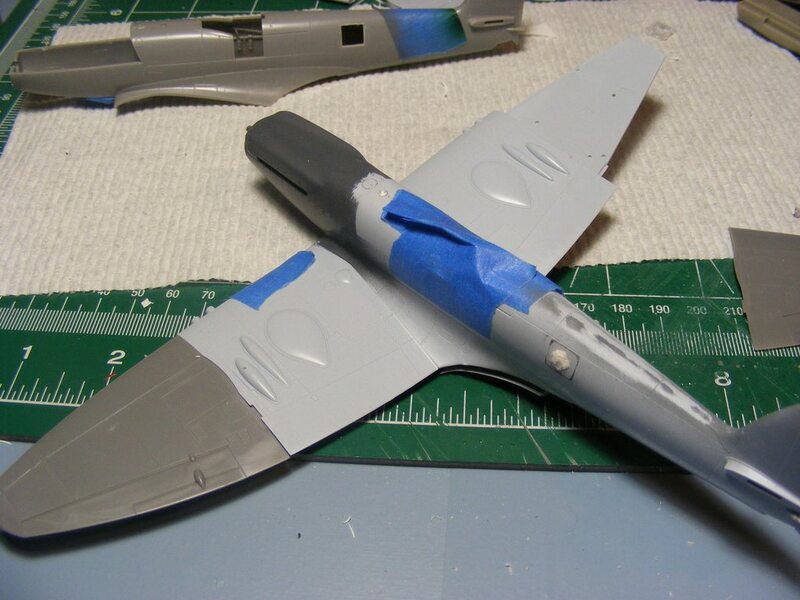 For one, I got the upper wing panels glued on and took care of the gaps at the wing route. 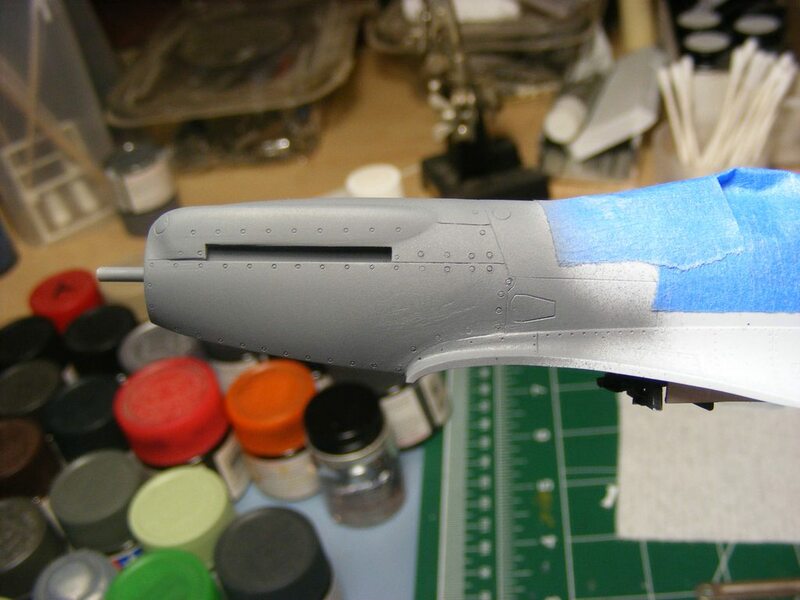 The back end was also glued in and filler added to smooth the transition. 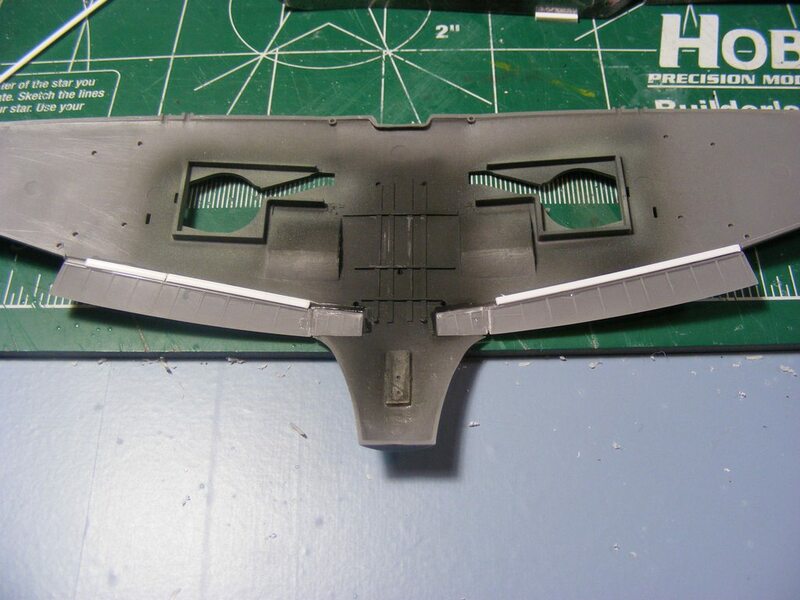 Then I started on the outer sections of the wings, and discovered that because the Fr.46 version of the kit is meant to have wings raised, that more work is needed to lower them. Didn't think it'd be a problem, and it's not insurmountable. 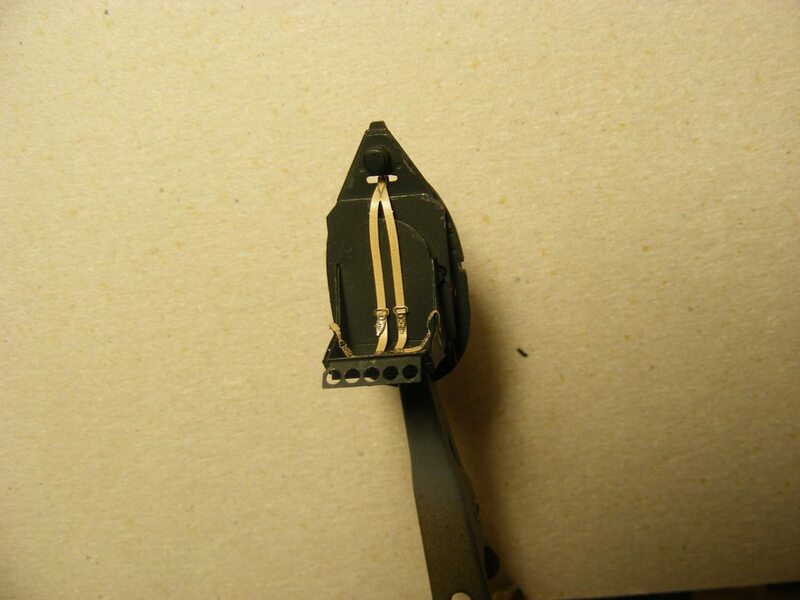 When putting the wings in the down position, the top was fine but the bottoms had a centimeter wide gap from front to back. I started filling this with blank styrene. Again, not terrible but just extra work. And I was fine with that. 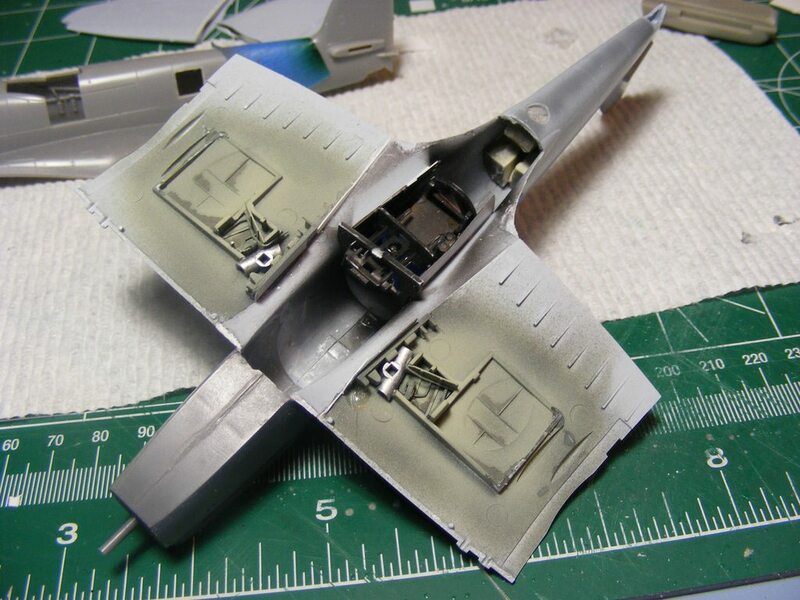 At least until the new resin cowl showed up for the second plane I'm planning, that one being 178 with a red spinner. The first one is 180 with a blue spinner. 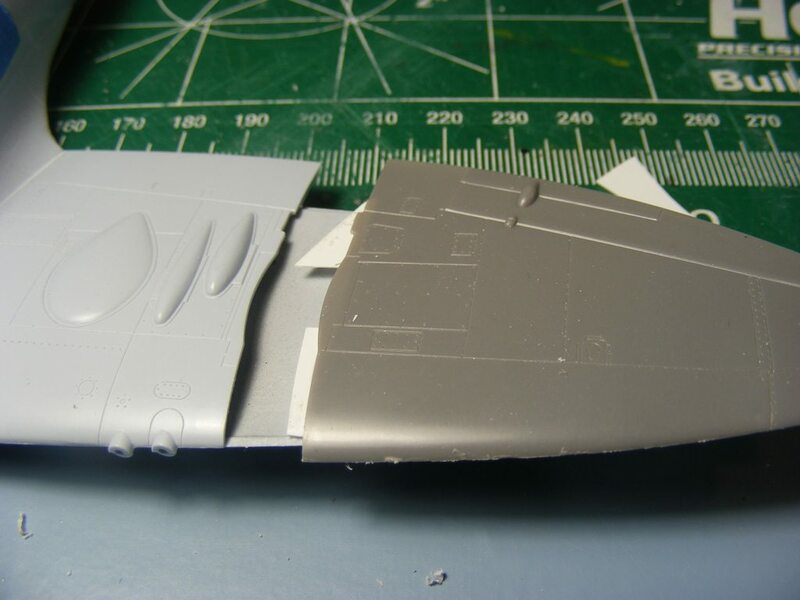 This time I checked first before cutting into 178's fuselage halves to clear room for the new cowl, which was good except for a slight gap at the back. I cut a little more out of the fuse halves and added a shim of styrene to the back of the resin cowl, and that tightened it up right. 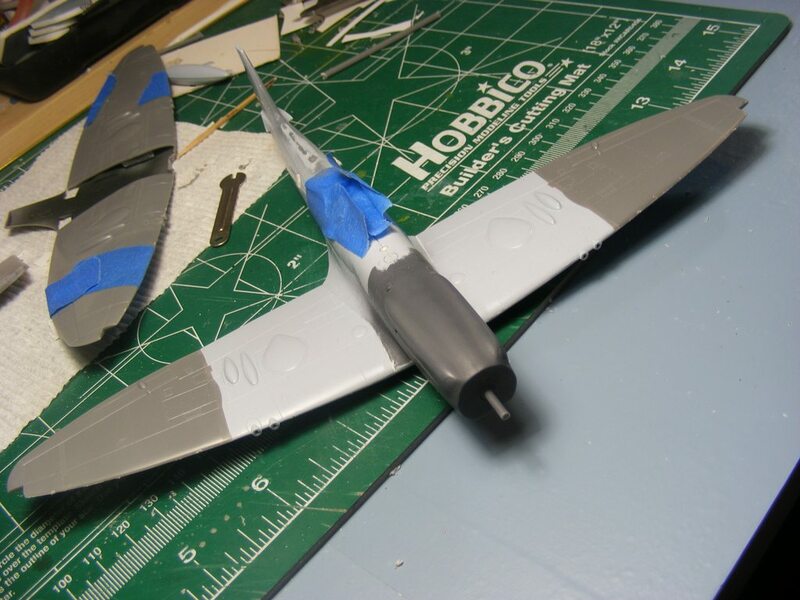 It worked good, and while I was on that I was thinking about the problem with the fit of 180s wing and I wondered if for 178 I could use the Fr.46 lower wing with the .47 upper panels. It's one complete section rather than in three parts as I was doing before. Turns out you can. 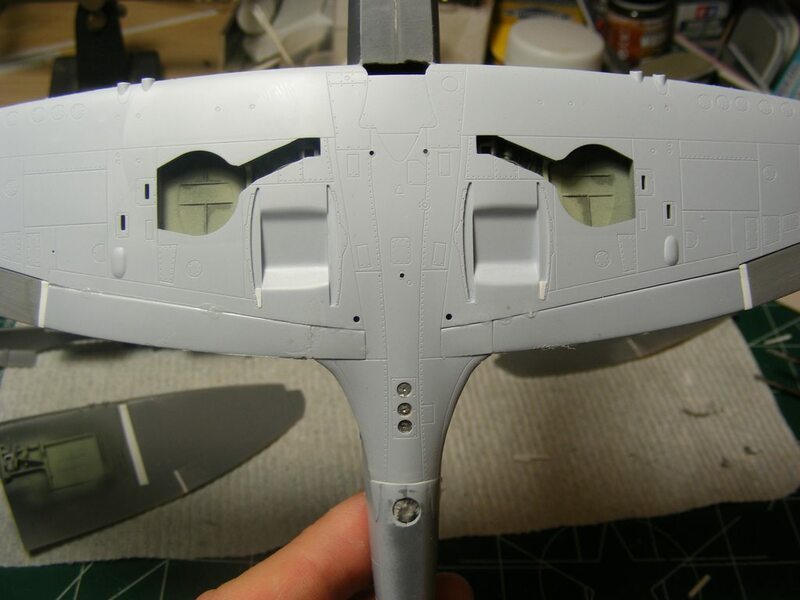 The detail on both wing options are the same, and a test fit was done with parts for 178. I had to snip off the locating pins as they didn't match up, but once those were gone, the fit was good. 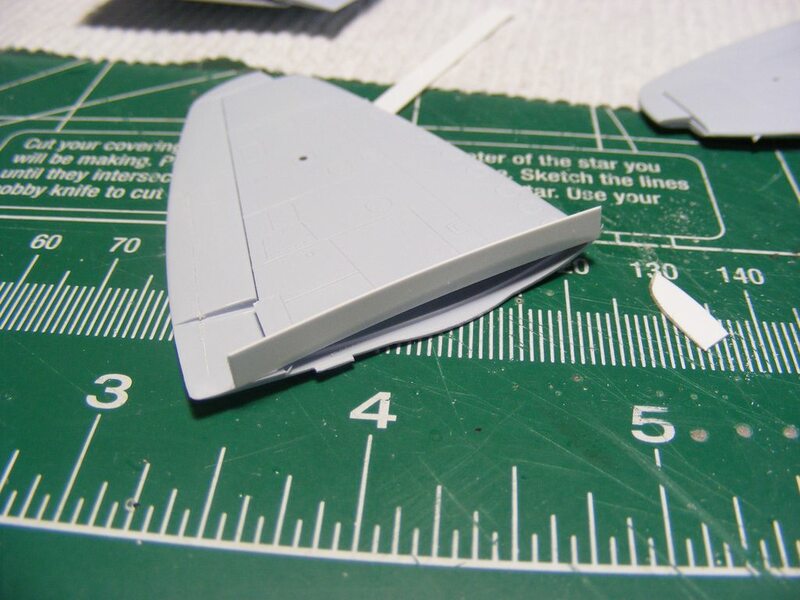 And even better, on the bottom the gap has now moved to the wing tip and is just a short section that'll be easily filled with styrene! 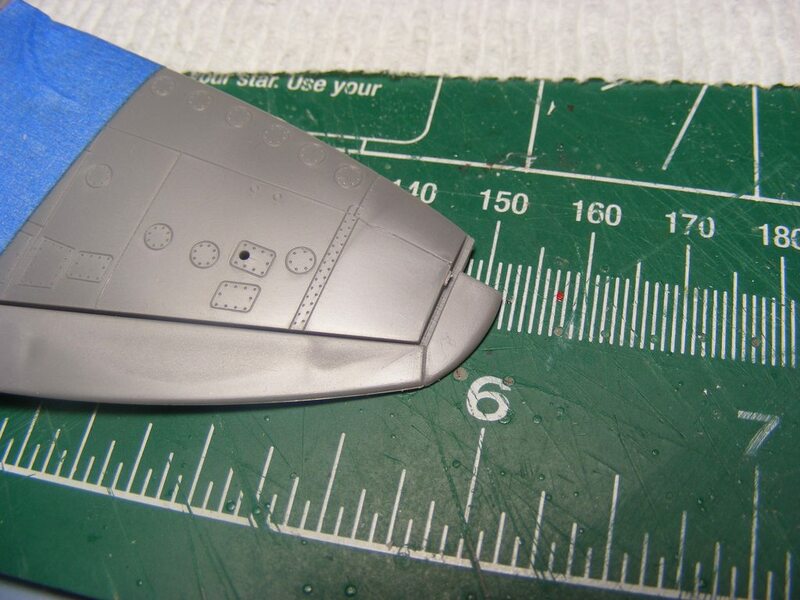 The wing seam also looks pretty sharp. I just hope it stays that way! But then I had another mental spasm. 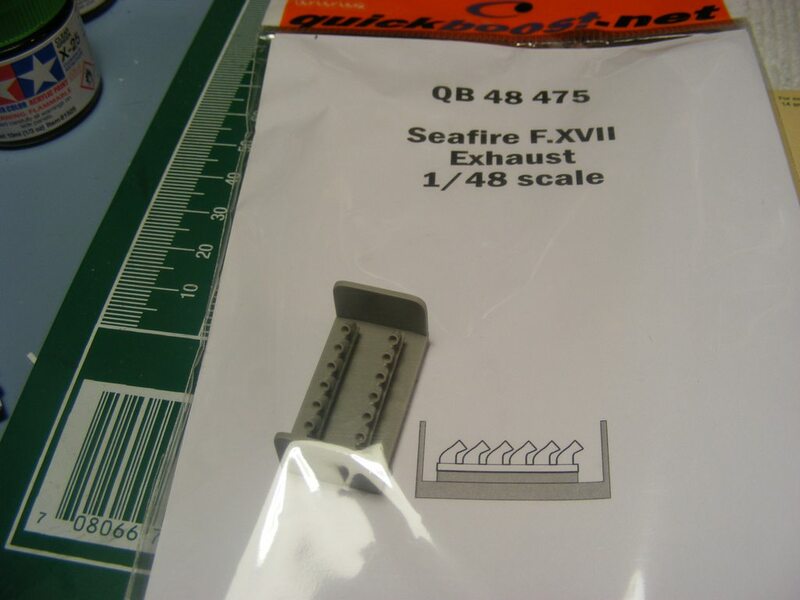 I have the extra Fr.46 lower wing for 180 and some spare Fr. 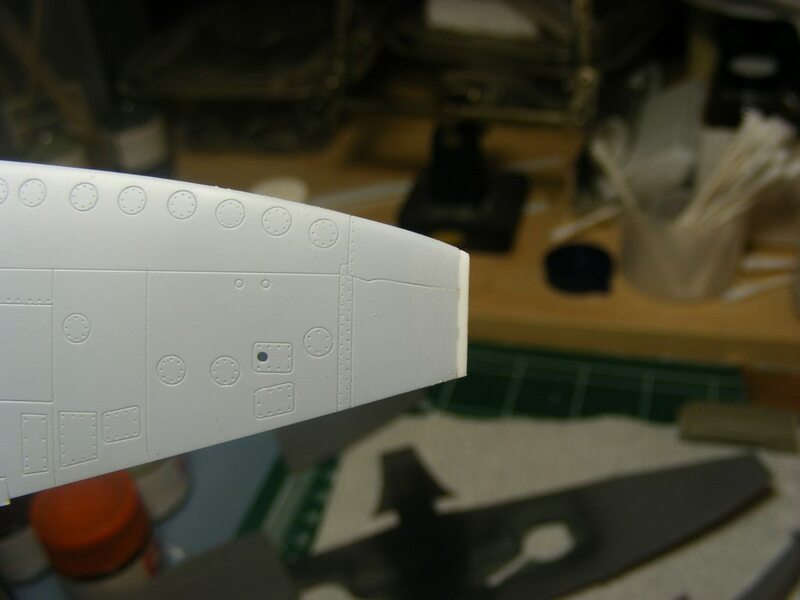 47 upper panels from the donor kit from which the fuselage haves are being used for 178. Could I do the same for 180..? Yup!! 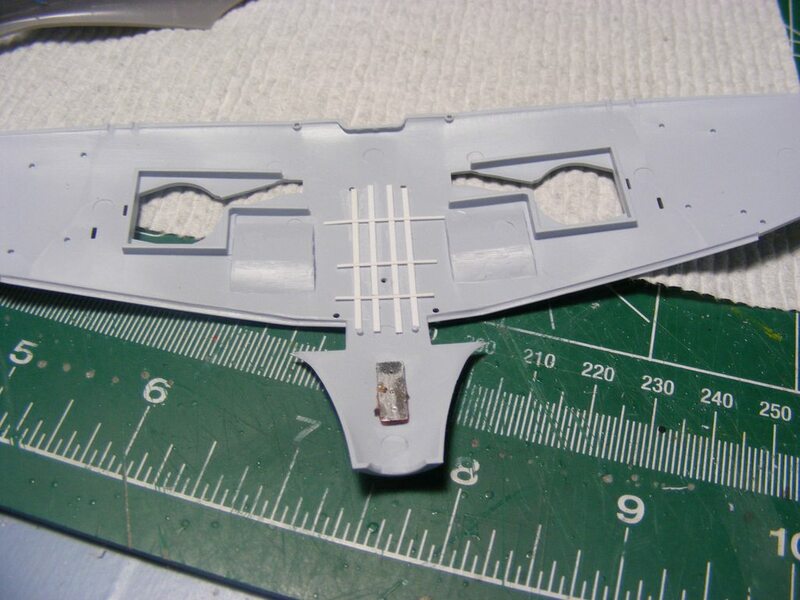 I pried off the center lower wing from 180, which came off pretty easily, thankfully. A test fit was done with the parts, same as with 178. 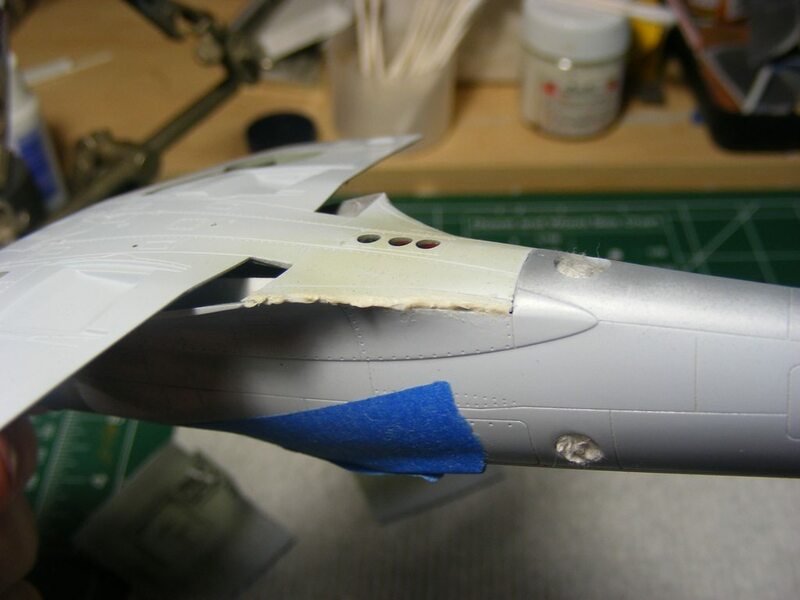 Again, the long gap that needed filling near the gear well is now one solid piece and all that needs filling is a small section near the wing tip. Easy-peasy! 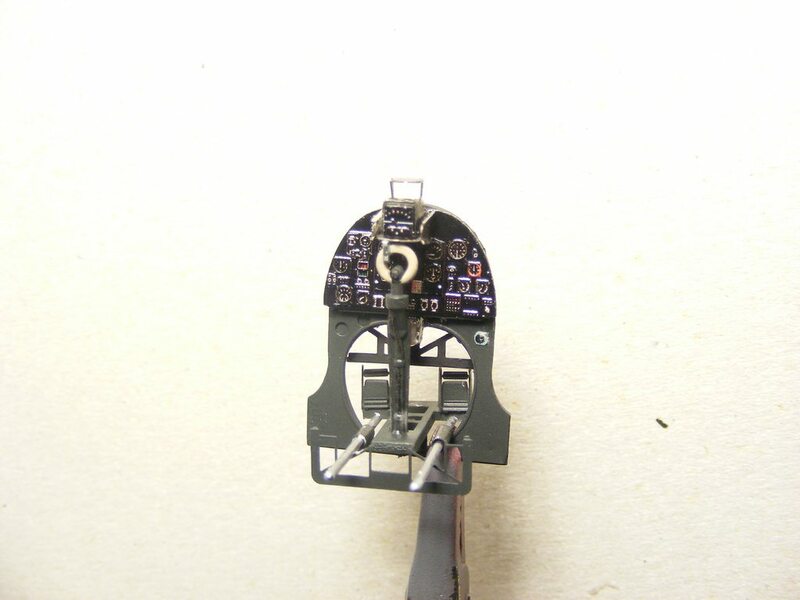 I moved on from there, putting some ribbing in the new wing section for the cockpit floor, then painting with dark gray and sky. 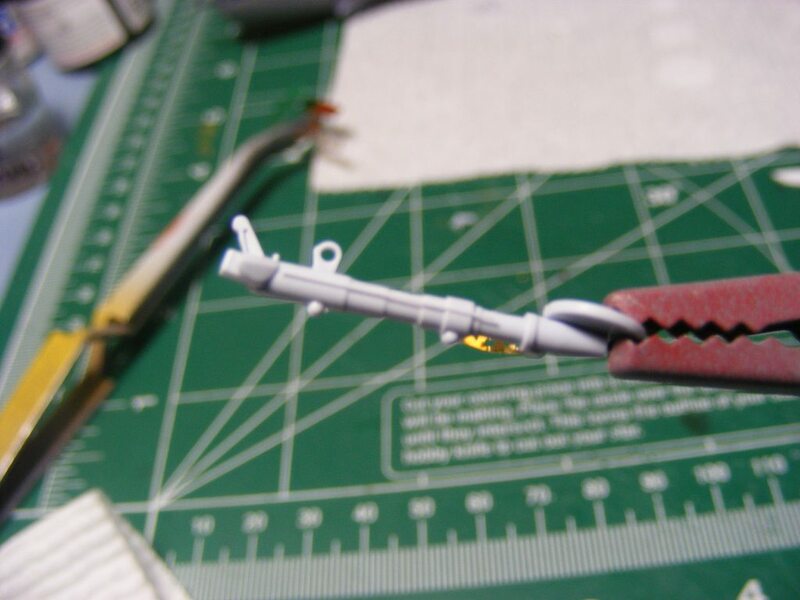 The three ID lights in the belly were saved from the old center section and glued into the new one. 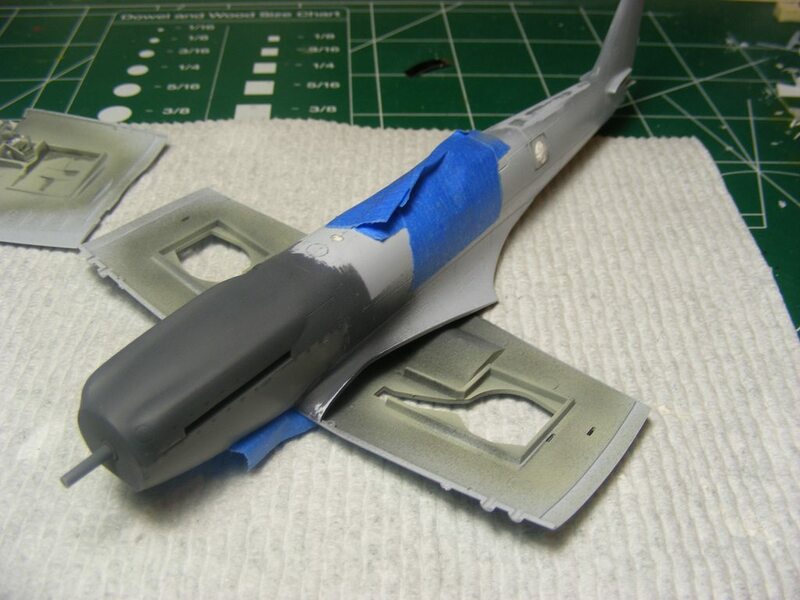 A notch was cut into the back of the piece and a piece of sprue glued into the fuselage, giving me something more to add glue to and to keep the lower panel from depressing too deep into the body. This is where I left 180 this morning, with its wings clamped and drying. 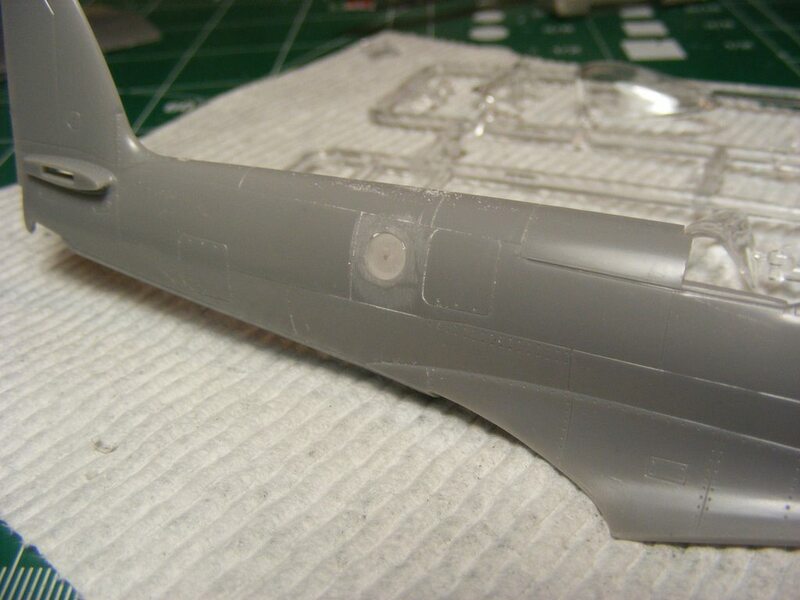 While that's setting, I went to 178 and started repairing its fuselage. The kit from bought from Kit's for Cash in the UK for donor parts and it had already been started. The ports had been opened for the cameras and the wholes were atrocious! 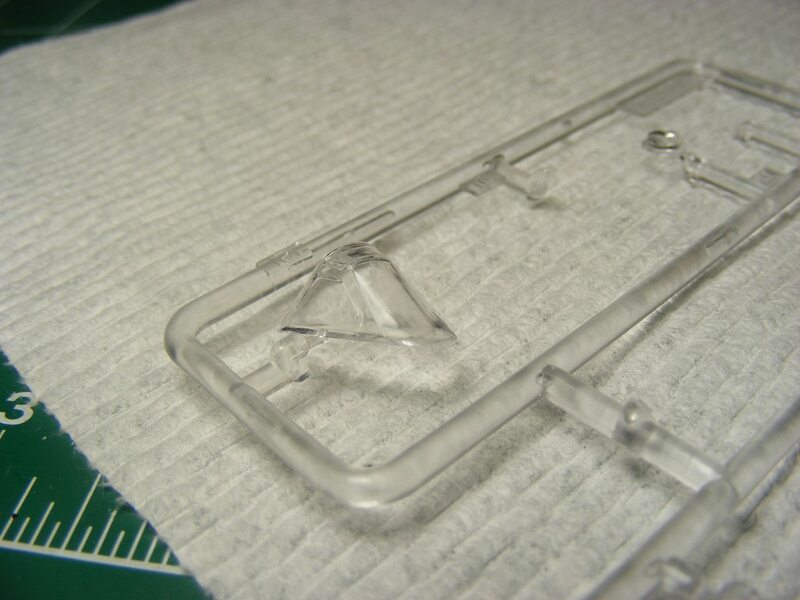 The port side was neatened up and the glass put in, as it is actually rather clear, as opposed to the newer molded 180s clear parts. Those are scratchy and clouded and pretty much unusable. 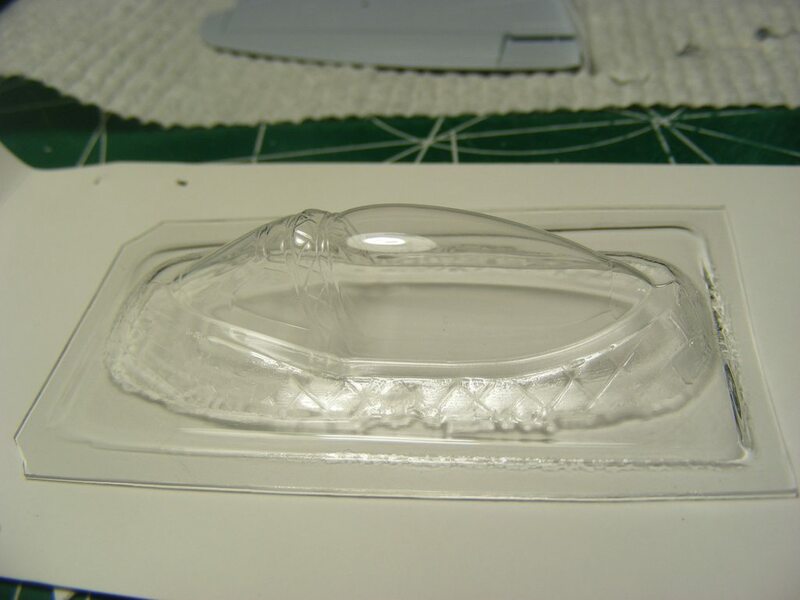 There are gaps around it that need to be filled and smoothed but that'll be easy. On the starboard side, the hole was pretty ragged and though the clear part was clearer it still suffered from a central sink mark right in the middle of it, so it couldn't be used. 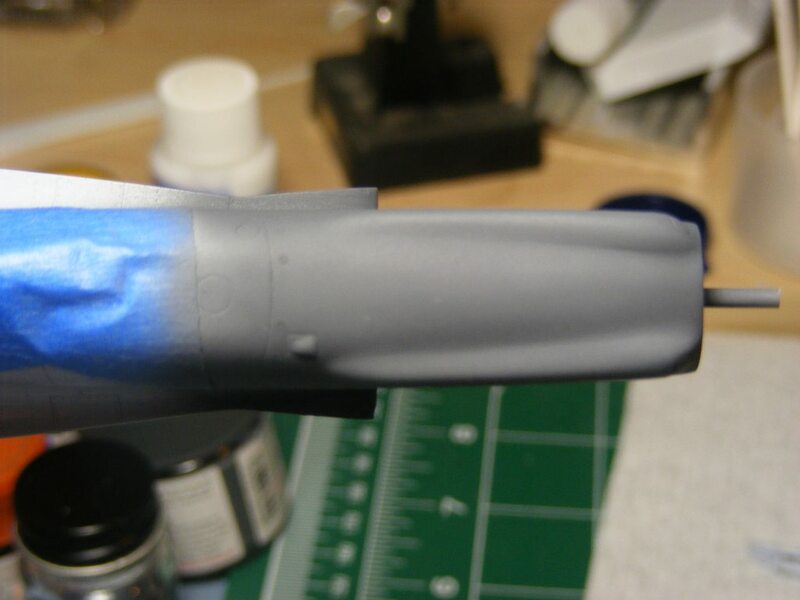 It could be used however as filler, so it was glued in and smoothed over. I'll drill that out later and it and the bottom hole for the belly cam will be filled with Klear near the end of the build. 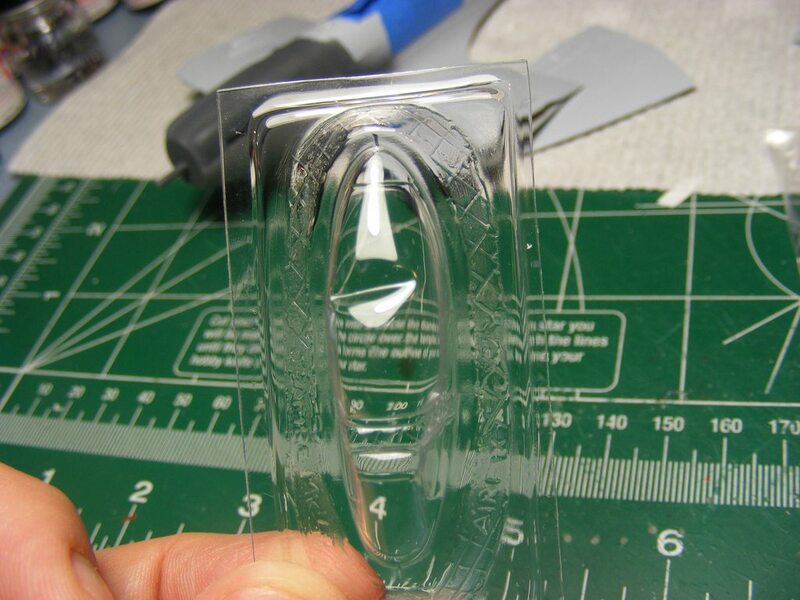 And just to show how clear this older kits 'glass' is here are some pics of the canopy. 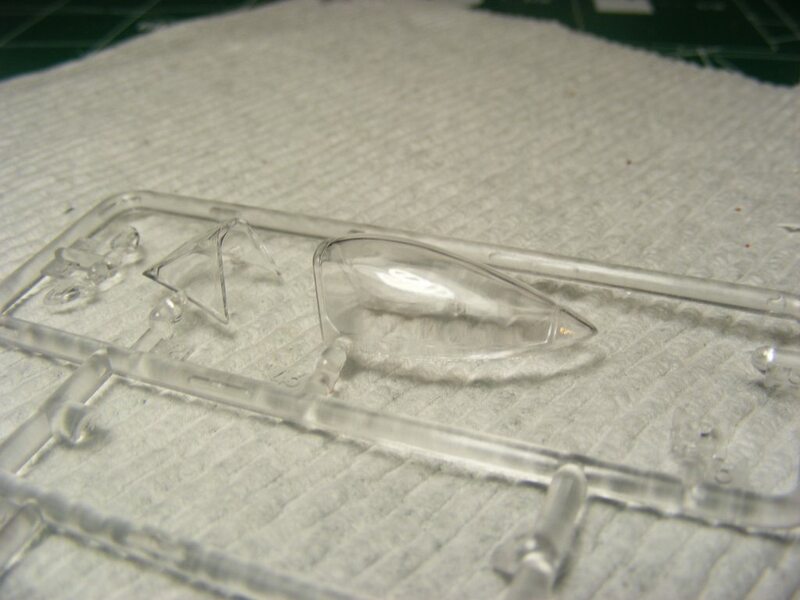 The newer boxing's molding and clear parts are clearly suffering from mold fatigue. The older boxings are just sharper and cleaner. I'd suggest that if you are going to buy one of these that you get the older boxing. 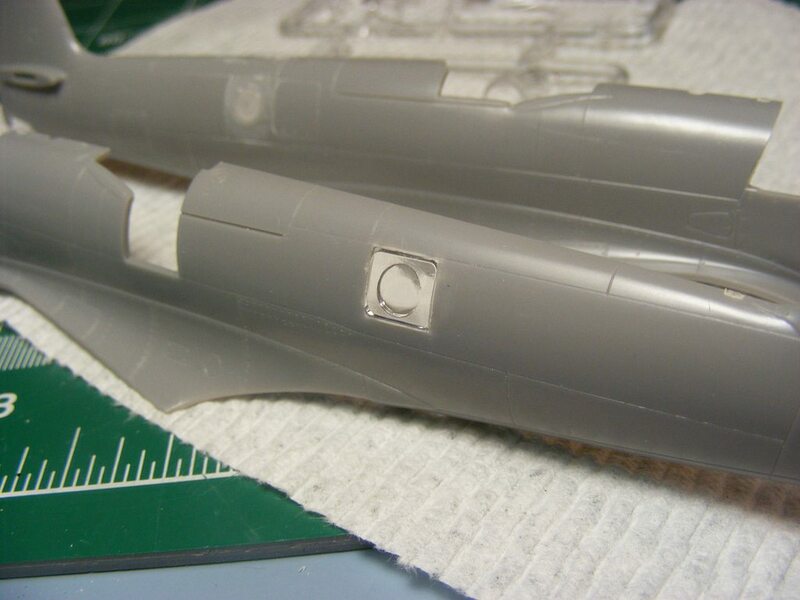 You may need to replace the decals as they are yellowing, but those are readily available. 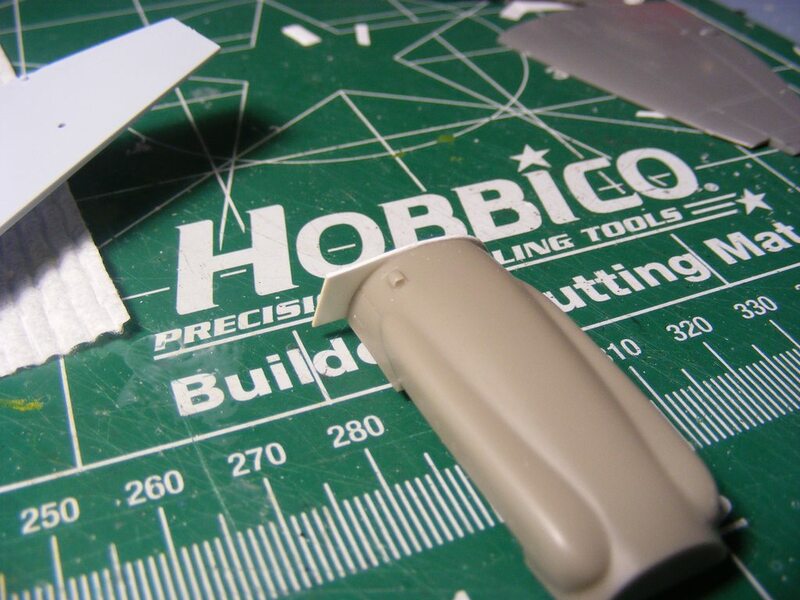 I have bought a few vacuform canopies from Rob-Taurus for these planes, though I encountered trouble with those. Basically they were damaged in transit and creased across the bubbles, making them useless for anything else than practice. Here's one that was bought from 1001 Models and delivered in a 'cushioned' envelope. 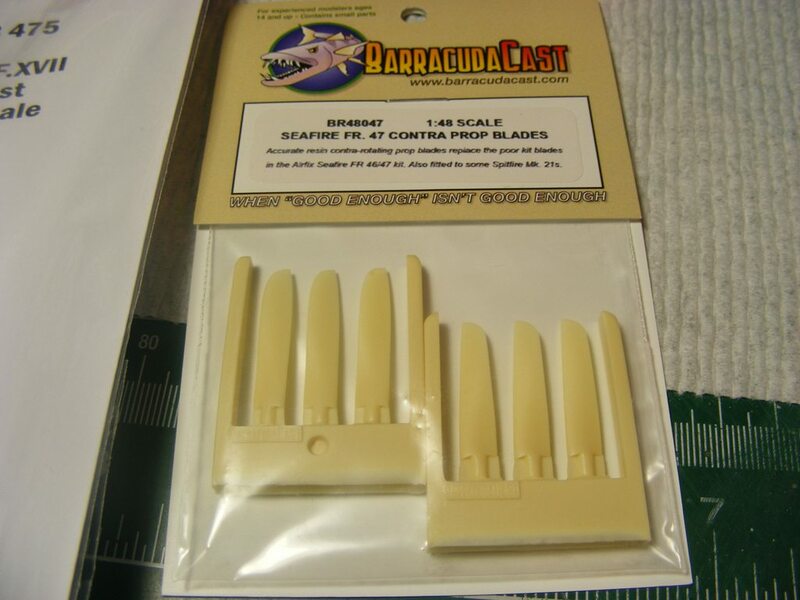 A replacement for that is on the way, but in the meantime I had also bought one from Sprue Brothers, that arrived just two days later!! Fast shipping time! And in a sturdy box!! As I said, I'll use the damaged ones for practice, but even if I do ruin one of the vac canopies, I can feel comfortable using the kit plastic in its place because it's so good. So that's where I'm at now. A little set back, but now further ahead - and starting another plane! Great details and very instructive post. Those are almost more helpful to the rest of us than then straightforward assembly posts. Everyone from noobs to experts can deal with things going right-- it's "what do we do when it goes wrong" that sends us to the forums for advice. Update here! Got more work done on 178. Like 180 the interior is all PE, from IP to side walls to seat. Though the wall extensions going down is styrene. 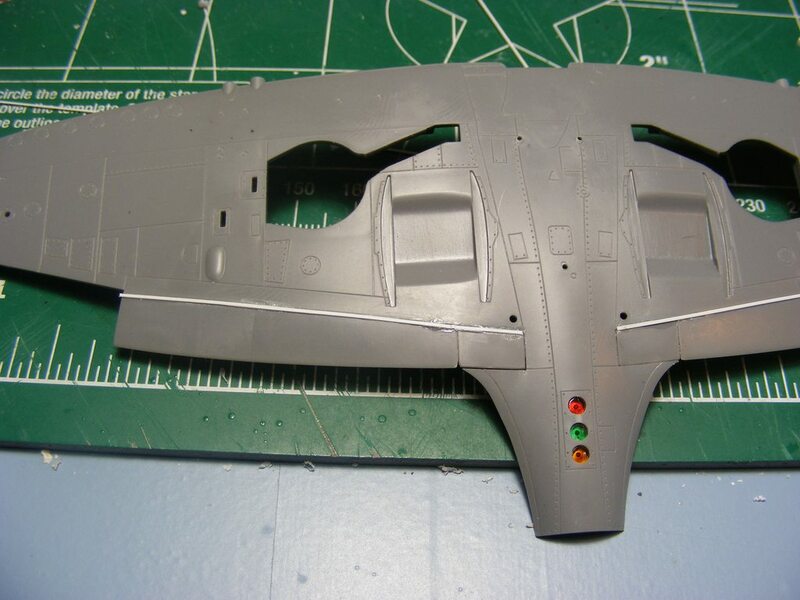 A little turn back to 180 shows the slight extensions needed to close the gap on the underside of the wing. 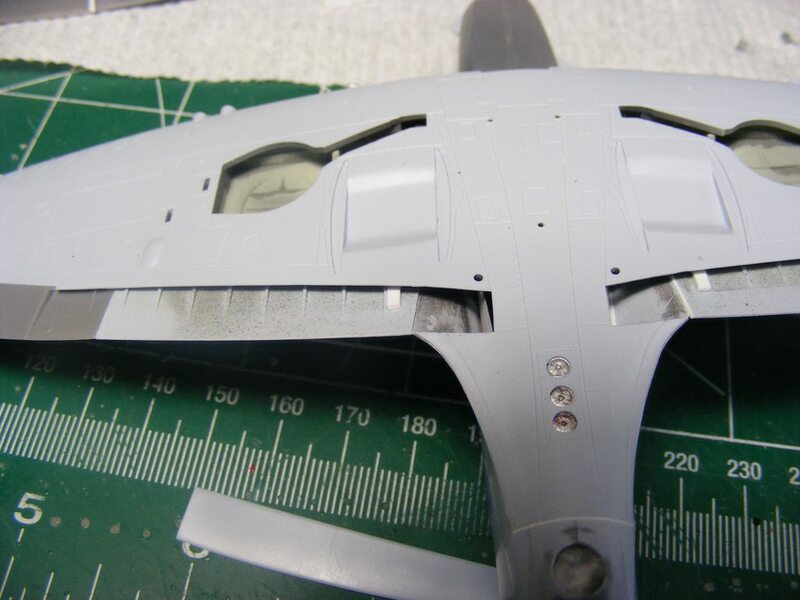 Again, this is using the Fr47 upper panels with the Fr46 lower wing section in the kit, so some miss-match is not a surprise. Upper panels going on 180 with some tabs for more gluing surfaces. Back to 178 again, and the wings are going a little differently. 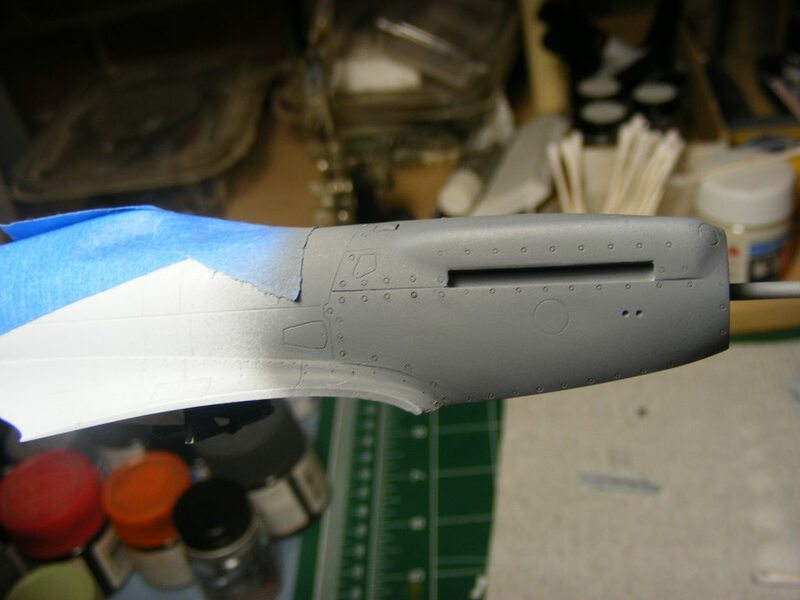 The upper panels are being glued before being offered to the lower wing. 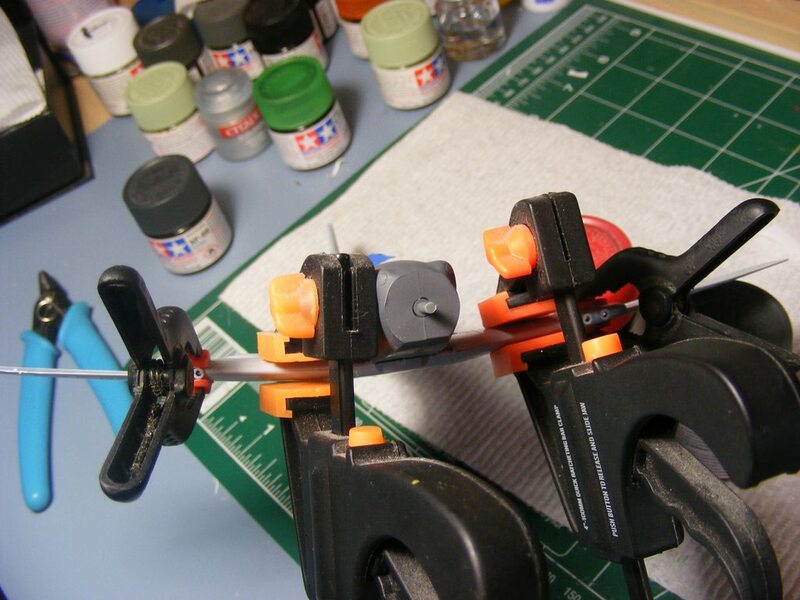 This made it easier to have a good solid bond between the parts and to avoid a slight step evident on 180. 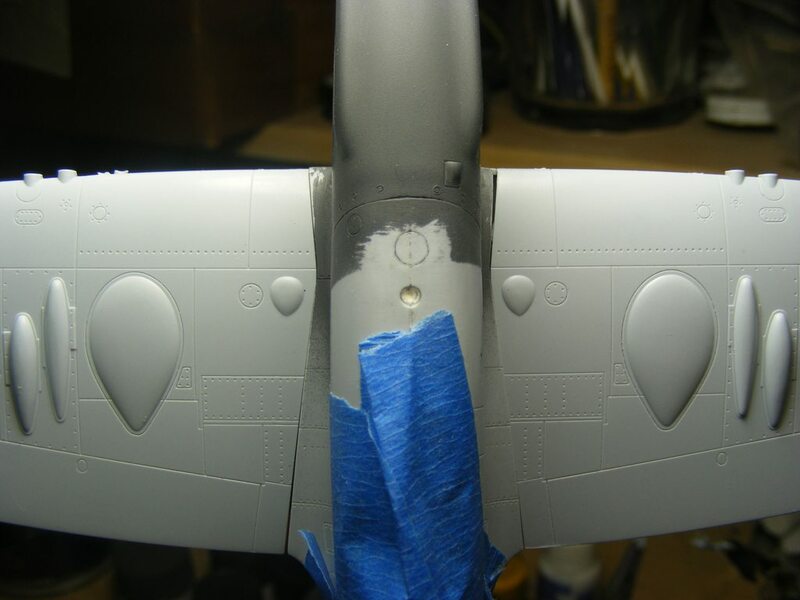 Like on 180 there is a slight gap at the end of the wing, but a little shim closes that up. 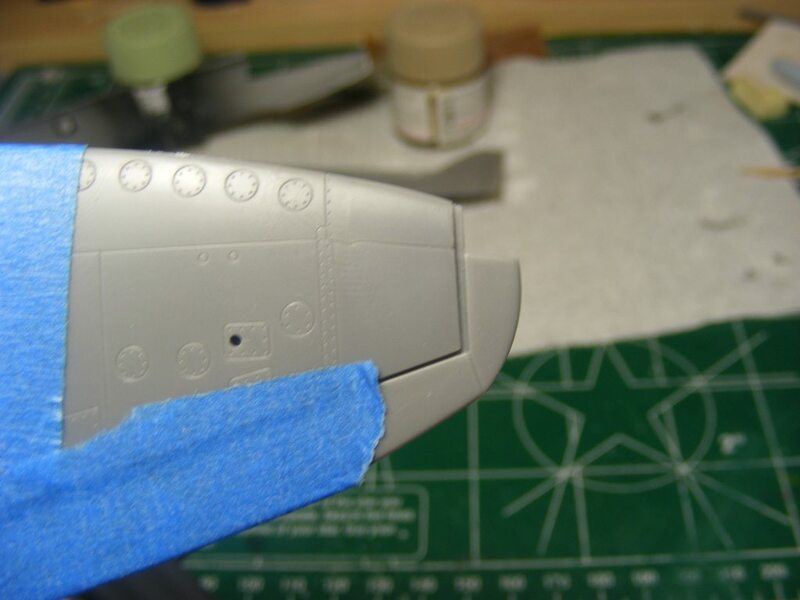 The closed gap at the wing tip. Onto the flaps and again both have to be done differently. I'm glad I started 178 before 180 was done as the latter is showing how to make it with the least fuss. 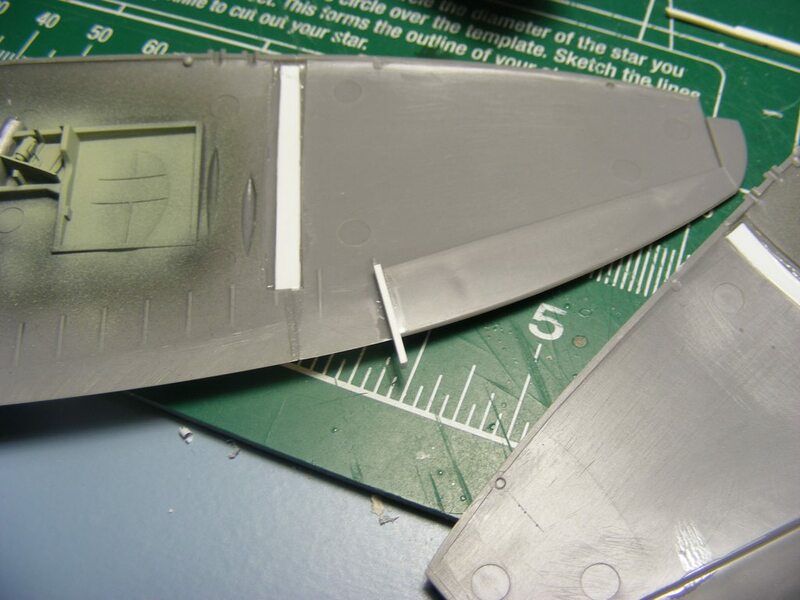 Because 178s wings are not on yet the flaps are easier to put on, starting with the inner flaps. 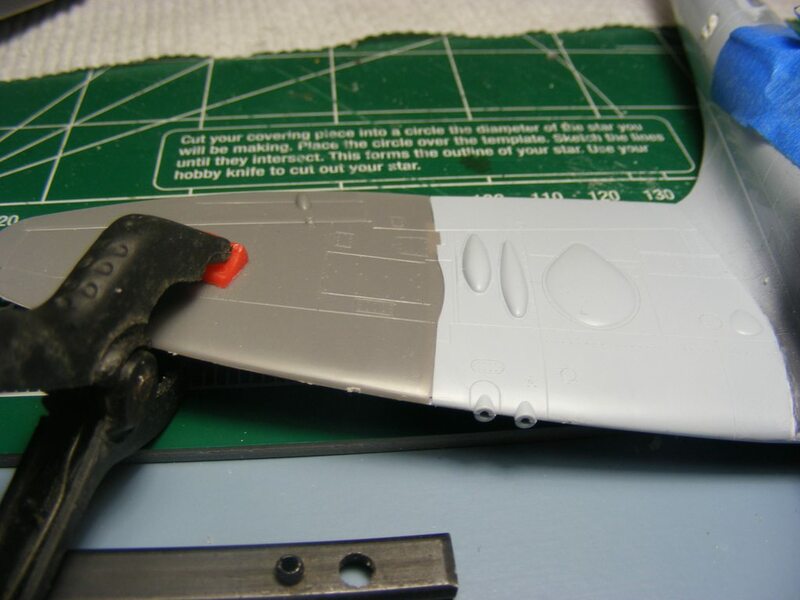 With the wing apart I can put as much glue as I want on the inside to secure them without worrying about having to clean it up again. 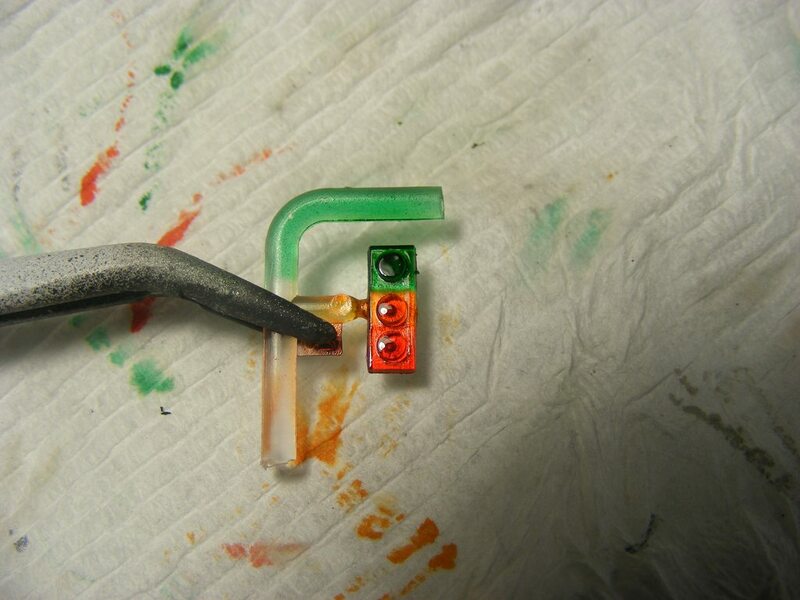 The larger flaps went next, with plastic underneath to strengthen the join. If it's not obvious they will be in the closed positions as most pics show the flaps stowed when not under power. And since the flaps on the 47 are larger than the 46, they have to be resized. It's easier since they will be up, as all I have to do is delete the original hinge seam and just extend the parallel line above it as the new hinge line. 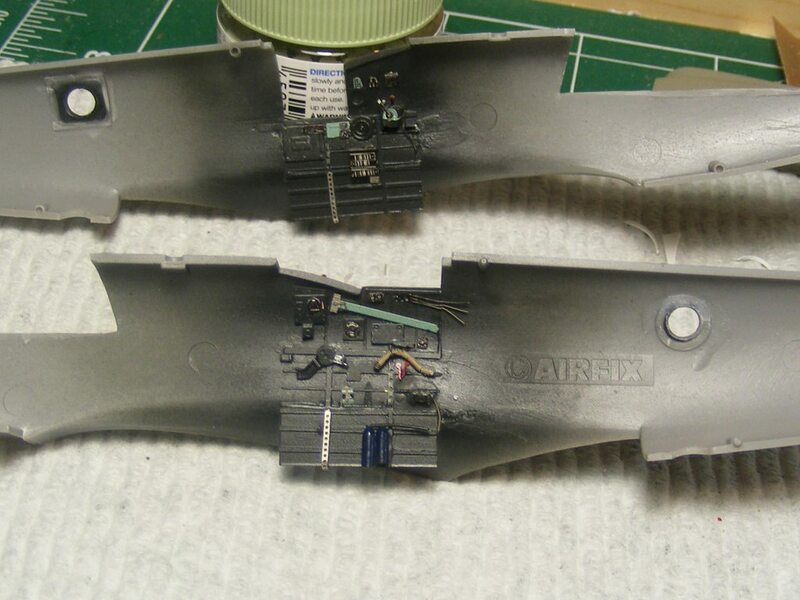 The under wing radiators will also have to be sightly angled on the outboard side to clear the new flaps when deployed. 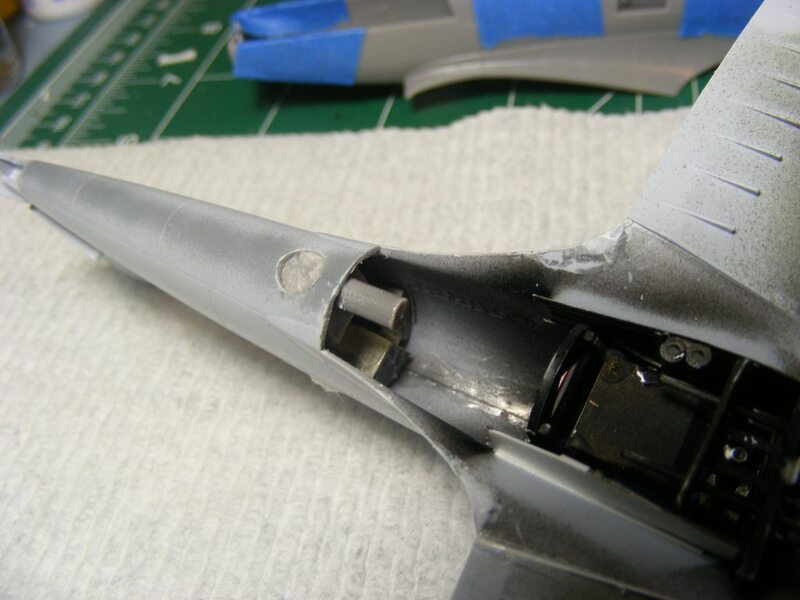 In the process of test fitting, another pair of gaps were found on both wing sets, between the flaps and the ailerons. 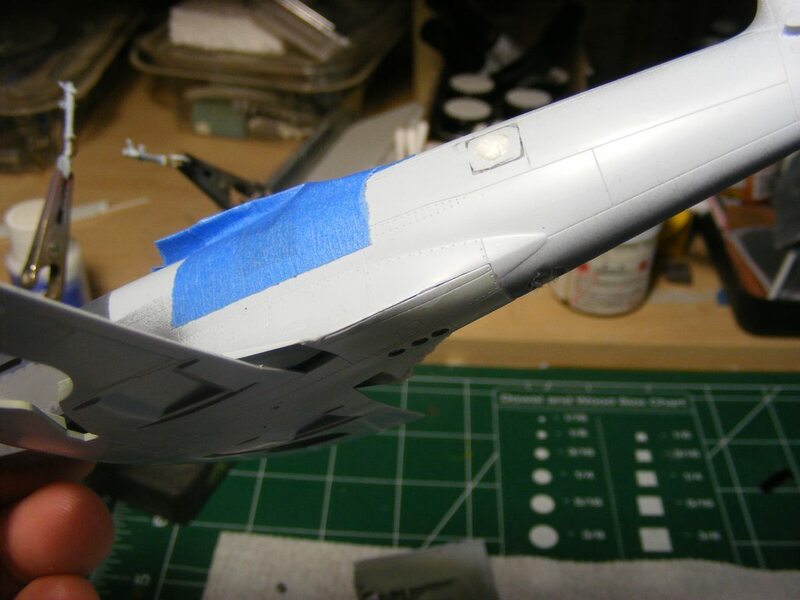 More plastic was added to close them up, lengthening the ailerons to meet the flaps and keep the separation line between them. 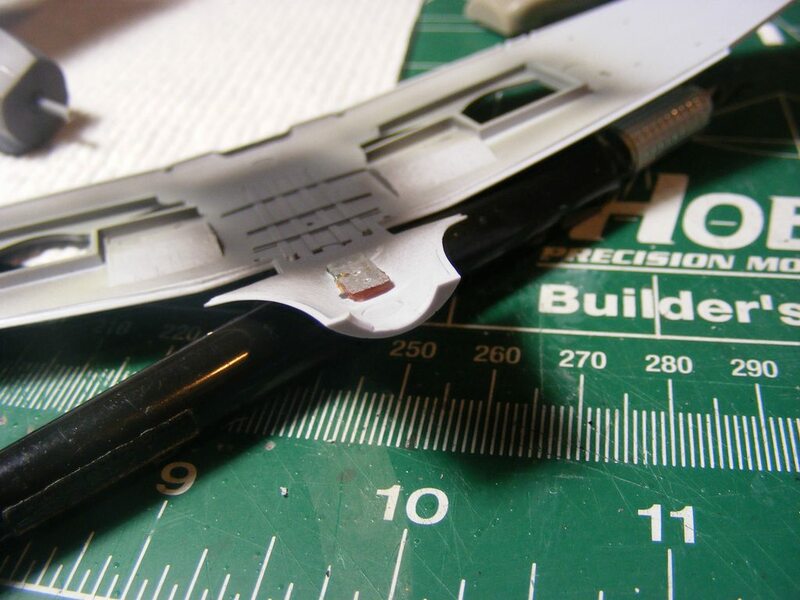 For the flaps on 180, I had to add some shims inside to keep them from falling inward. 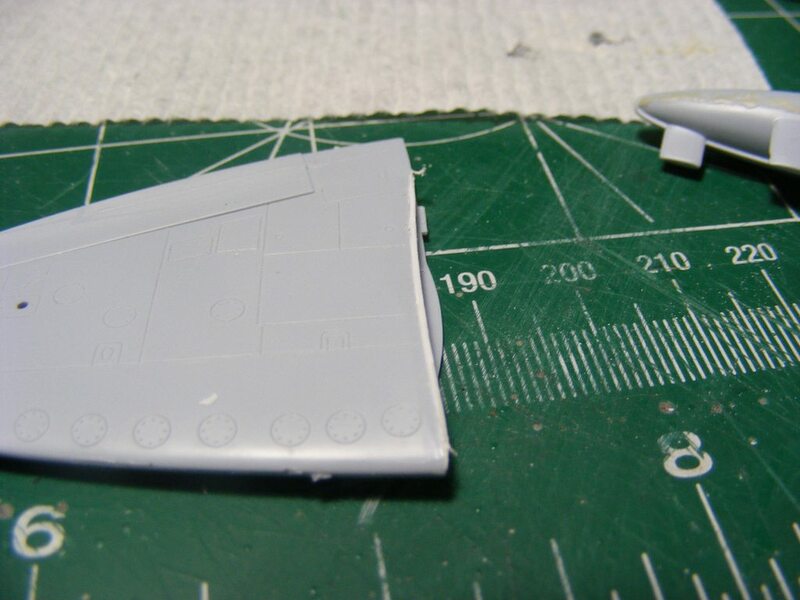 The flaps were glued together first, keeping a slight kink as they are not flat across the width of the wing. All glued in place and they look as bad as a good sin, mostly because of the glue that had to be put on the outside - and that needs to be cleaned up now. But in truth, it was all going to be sanded anyway to enlarge them. They'll require a little more scribing but it'll look good in the end. That's it for now. 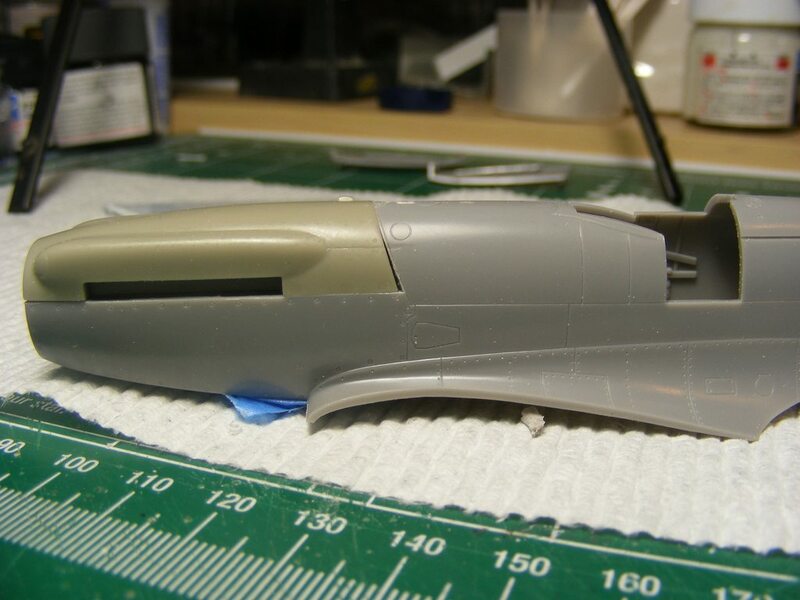 Next update coming with sand sand sand and 178s fuselage going together. Sweet goodness! I do too like the belly lights. I wondered what happened to their color after the fuselage was closed. These both started as quick builds! If you can believe that! 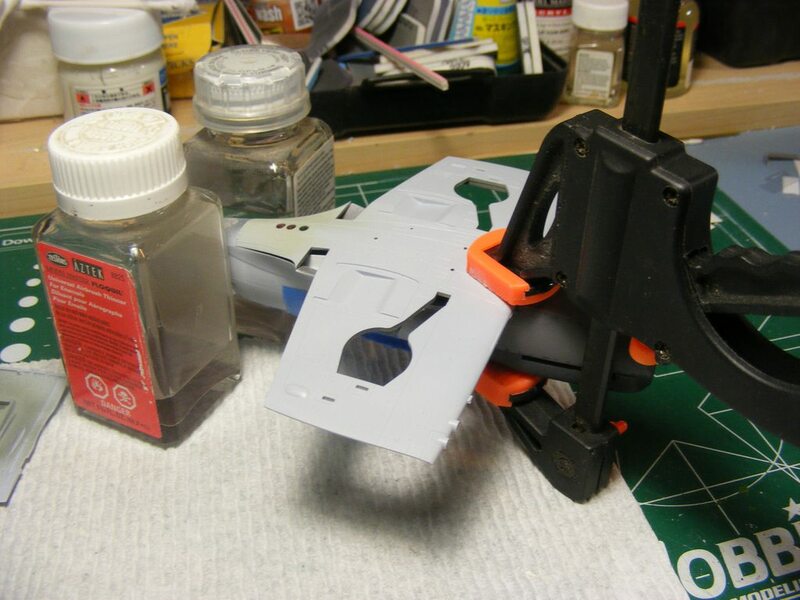 But after realizing that building an FR47 from the kit would require quite a bit more than trimming and gluing, I cracked open a second and turned into a dual build to give me some nice headaches. 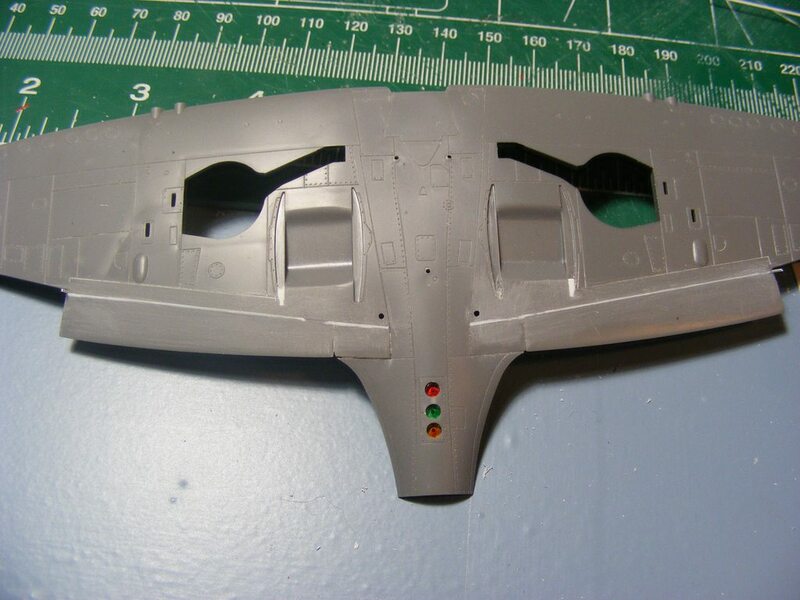 As to the belly lights, the ones on 178 (dark gray) are better than the ones on 180 (light gray). I drilled a hole in each 'light' to represent a bulb, back-painted them silver and then painted them with Tamiya clear red/orange/green. I then ended up having I had a little problem with the latter and had to repaint silver over them in prep of redoing them after main paint is done, so that's why there is a color difference. 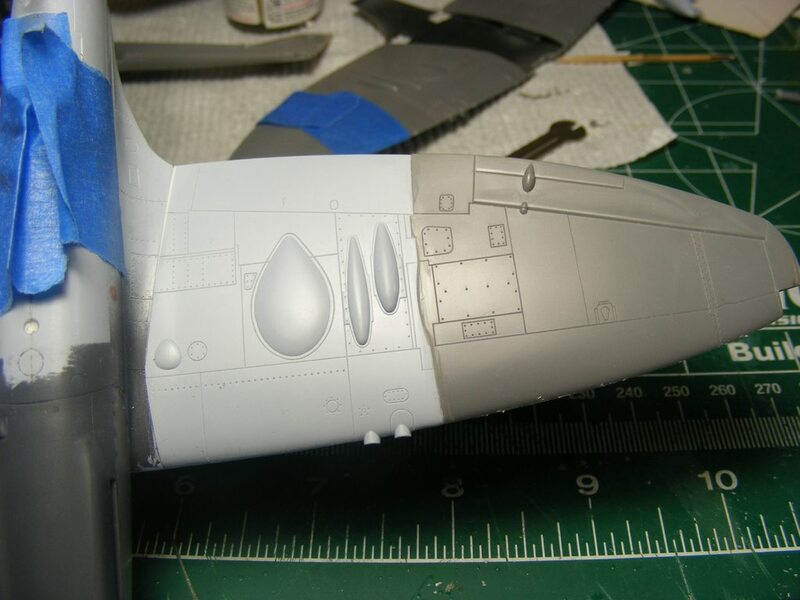 They are on pause at the moment, tucked under the modeling bench while a 1/48 Dottie Mae is being built for the Britmodeller P-47 GB. I'll post its build soon. 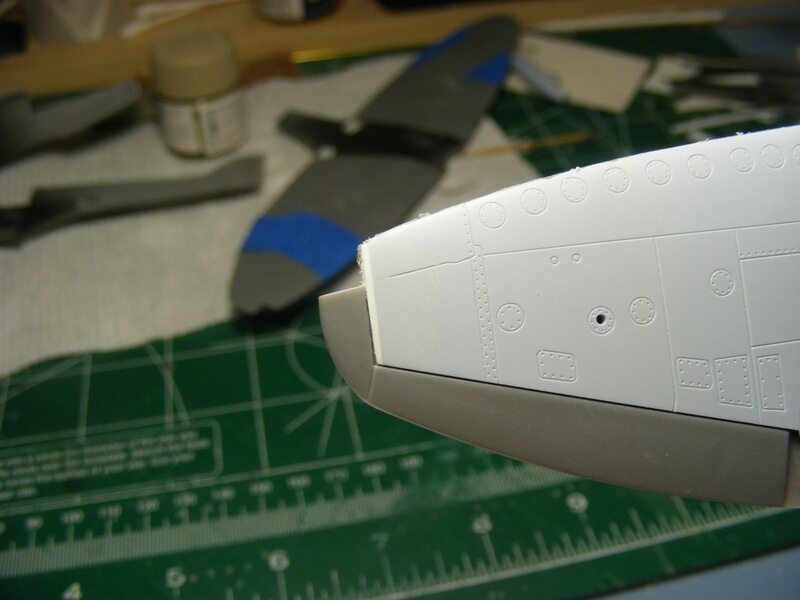 After that is done, the Seafires will come back out, to be accompanied by an Academy Spifire Mk XIV E that has been sitting incomplete for a few years now. It'll need a little straightening, but all three are just about at the same build stage.